Nintendo's 3DS family of console owes its success to its uncanny ability to appeal to players of all ages, but like so many of the company's products, the core of the range is designed around appealing to the younger end of the spectrum. Like the DS before it, the 3DS — and its sibling, the 2DS — is proving to be the perfect stepping-stone for kids when it comes to picking up video gaming as a pastime. Two of Nintendo Life's directors — Darren and Damien — are lucky enough to have young families of their own, and have been watching from the sidelines as their respective offspring take their first tentative steps into the realm of interactive entertainment, all thanks to the universal charms of the 3DS range. We thought it would be interesting to chart how little Emma Calvert and Noah McFerran are getting on with their handhelds, and pick out five of their most-played titles this summer. Darren Calvert: Emma has always had a keen interest in gaming ever since she was a toddler, and whenever my back was turned she'd be sneaking off with my iPhone to mess about with Angry Birds or simply rearrange all the icons on my home screen! For her 4th birthday, to give her a bit of independence, we treated her to a standard-sized rose pink 3DS console and — amazingly — over 2 years later it is still intact, despite having a few minor battle scars. At the time I was concerned that the hinge of the clamshell design might not withstand abuse from a youngster — after all, the DS Lite did suffer this problem — but my fears were unfounded. One of Emma's favourite things at the moment is getting StreetPasses whenever we go into town, so with the clamshell design it's great to be able to just throw the 3DS in my backpack and not worry about it getting damaged. The parental controls on the 3DS are fairly comprehensive and it was a simple matter to disable the 3D effect. Nintendo themselves recommend that only children over the age of six should use the system in 3D mode. Occasionally for a treat I'll enter the top secret PIN code for Emma so she can spend a limited amount of time playing games in 3D, which she loves. Whenever Emma completes a puzzle piece image in StreetPass we'll enable the 3D so she can enjoy the resulting animation in it's full glory. Over the years we've gone through several styluses; they get lost from time to time or badly chewed, so eBay has been a great help in locating cheap replacements! This is much less of an issue now that Emma is 6. Kids do instinctively try to operate touchscreens with their fingers, perhaps due to exposure to tablets and smartphones. While you can get away with this to some extent on the 3DS, with it’s resistive touchscreen it really is better in the long run for the child to get used to using a stylus. Emma’s younger brother recently got a 2DS and it appears to be equally as indestructible. From my perspective as a parent I like that it does not have the 3D option; this has brought the cost of the device down to a much more child-friendly price and now there is no dilemma about if 3D should be enabled or not. Emma says she finds the 2DS equally as comfortable to hold and finds the select/home/start buttons far easier to press than the ones on the original 3DS. It was a clever move to place the wireless on/off button in the software on the 2DS; the physical slider on the 3DS can get knocked accidentally which will result in no StreetPasses — and inevitable sadness. Lovable pink puffball Kirby was instantly appealing to Emma and she picked up how to play this cutesy platformer in no time at all; the colourful levels, quirky foes and energetic background music made this a real hit. Emma gets a kick of going back to levels which she has completed in a quest to find all of the hidden key-chains and she’s amassed quite a collection. Every now and then the game will throw up a surprise like sucking up the Waddle Dee houses in the style of The Three Little Pigs, which amuses Emma no end. This is definitely one of the more accessible and entertaining platformers for younger children. I was surprised how quickly Emma took to this Mii life-sim. Once we went through the initial process of adding detail to her lookalike island inhabitant Emma was off and running. Before long out of the other room she was singing “My eyes half open, I want some cofffeeeeee” along with one of the songs her avatar was performing. As most of the game is voiced with different Mii characters, there is not too much reading to worry about. Emma was able to feed the Miis with the type of food they like to eat without too much difficulty, for instance. The quirky fun nature of this game proved to be an instant hit with Emma and has become her go-to game for a quick bit of pick up and play fun for giggles. As with Kirby, Super Mario 3D Land’s colourful landscape is instantly appealing to young children. It was a little bit more challenging for Emma to learn to play, little things like holding down another button to run take a little bit of time to click, for instance. Thankfully the early levels guide the player into the game gently and the lessons can be picked up there. Over time Emma has managed to beat the whole game; of course sometimes we had to resort to using the invincibility leaf assist block which appears when Mario loses five lives. Even with the White Tanooki suit, advanced platforming skills are still needed to clear the later levels. This game does use the 3D effect in some interesting ways in some areas, so with this restricted to 2D it can sometimes make these sections less obvious. At the tender age of six, I was surprised how easily Emma got on with this one. By typing words into Maxwell’s magic book you can give a pig wings, or ride a dinosaur to overcome a traffic jam. You are only limited by your own imagination and of course the words which you can spell. For young kids the puzzles aren't really that taxing, but as the scenario is displayed on screen in text and not spoken out having a parent nearby to give the occasional prompt certainly helps. It’s a very bright and cartoony game which was instantly appealing to Emma. As an educational tool this is pretty neat for expanding a child’s vocabulary and an encouragement to learn how to spell more complicated words. But be warned, lots of parental input will be required with younger kids. As Emma is forever drawing doodles on paper, I had a thought that she’d get a kick out of an Art Academy game. This Pokémon-themed version hits the spot perfectly and following the step-by-step instructions Emma was able to create a cutesy sketch of Pikachu in no time. Lessons start out simple enough for a youngster to grasp and comparing their masterpieces to fellow student Lee’s appalling artistic skills offers a nice bit of comic relief. Before long Emma was able to draw brilliant Bulbasaurs and a seriously charming Charizard. 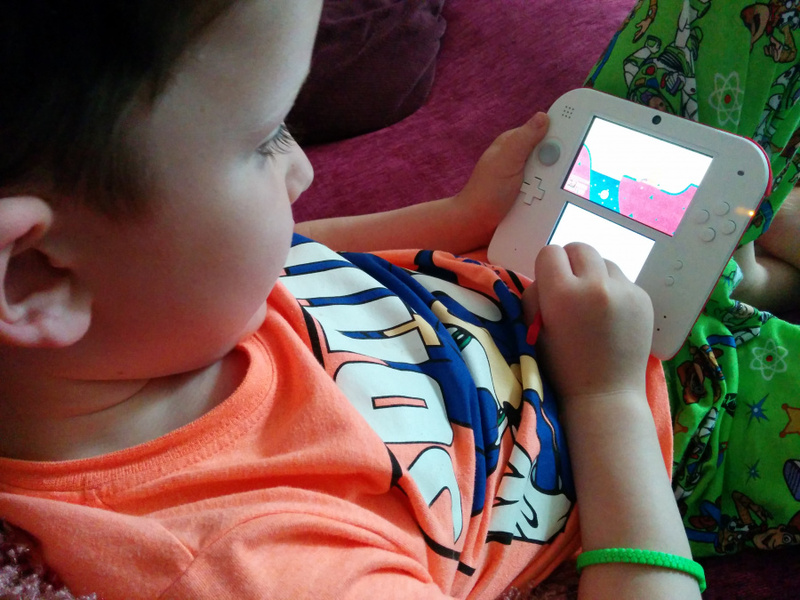 Damien McFerran: Noah's 2DS has become an essential part of his everyday entertainment, and is thankfully chunky and robust enough to withstand the kind of punishment he puts his toys through. He was initially a bit sceptical about the console as he'd seen me playing on my 3DS and commented on the fact that they were radically different in design, but after a while he began to prefer the slate-like form factor of the newer machine. The lack of a hinge means there's nothing to snap, although as a protective parent I have noted that this means the screens are exposed at all times, so I've had to ensure that Noah is careful not to accidentally scratch or mark the displays. A protective case was one of the first things I purchased for the system, and is highly recommended if you've got particularly clumsy kids. Darren touched upon the lack of 3D on the 2DS, and I did notice during some games that the lack of depth meant it wasn't always obvious to Noah what to do next — an unavoidable consequence of only having a 2D screen. However, I'm continually amazed at how amazing some 3DS titles look, even without 3D. In some respects, it's a better visual offering, as you don't have to constantly adjust your grip to ensure you hit that all-important 3D "sweet spot" — something I know would have annoyed Noah quite a bit! Also, like Darren, I've noticed that the stylus is often the first casualty when a child has a device like the 2DS. Noah has already managed to chew through or lose countless styli on the DS and Wii U, so I've had to get his assurance that the one that came with his 2DS won't suffer the same unfortunate fate! However, replacements are cheap enough, so it's not a massive issue. Noah is terminally addicted to Mario Kart 8 on the Wii U, and I've retrospectively introduced him to the previous title via his new 2DS. Given that he already has plenty of on-track experience under his belt he has settled into the game with relative ease, but Mario Kart is so accessible I know he would have picked it up quickly regardless. It says a lot about the overall quality of this game that it's still one of the console's most appealing and engaging releases more than two years after its launch. This is one of those unique pieces of software which effortlessly transcends boundaries of age and is a game that both of us can enjoy and appreciate. This has perhaps been the surprise package of Noah's 2DS experience so far. I have to admit I totally ignored this game upon release, but having seen how amusing Noah finds it, I've been tempted to steal his copy and have a go myself. Predictably, the creature creation mode has been a constant source of amusement, mainly for the silly voices and daft monsters that Noah can pull from his worryingly fertile imagination. However, he's really been sucked in by the progression of the game itself, and keeps on coming back to this title time and time again. Noah's currently going a bit mad over Disney's Planes, so this provides the perfect tonic for his aerial fixations. It's encouraging to see that he likes the same things about the game that I did back when it launched alongside the 3DS — the feeling of freedom is fantastic, and while the challenges are there to maintain interest, Noah is perfectly content to simply fly around the island looking for new sights to take in. Even without the 3D effect — which I thought was great on the 3DS — Pilotwings Resort looks stunning, and the breezy, cartoon-like aesthetic captures Noah's imagination perfectly. Despite the critical drubbing it received at the time of launch, Yoshi's New Island is a game that Noah has really warmed to. Granted, it's not quite as demanding as some of the games I'd personally recommend for the system, but the pedestrian pace and eye-catching graphics have clearly had the desired effect on my son. Yoshi's New Island also provides me with the ideal jumping-point to get him into the original SNES Yoshi's Island, and has him primed and very excited for the forthcoming Yoshi's Woolly World on the Wii U. This was a game which I honestly though Noah would struggle with, given its pretty extreme difficulty level. He's dabbled with the Wii U sequel Tropical Freeze, but only with me helping out in co-op. Going solo is much harder for him, but his familiarity with the characters has allowed him to overcome his frustration and keep trying. Watching him play this title really hammers home for me the Nintendo difference — the company's library of characters has such universal appeal that players of all ages find them irresistible, and I'm not sure that is acknowledged enough in the modern video game market. So there you have it. 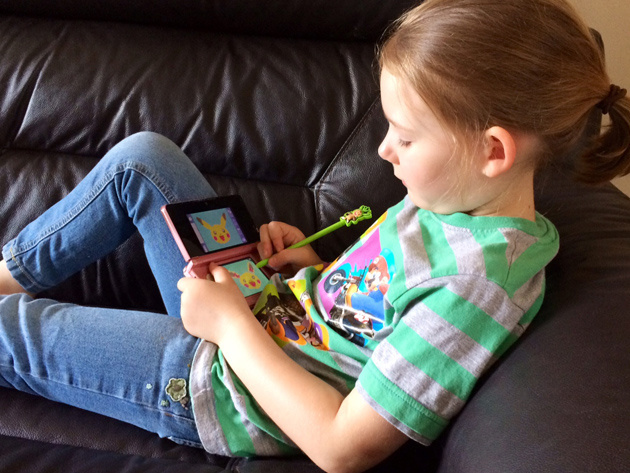 Do you have kids who play the 3DS? What games do they like? Share your thoughts below! Just introduced my 6 year old to the world of Pokemon yesterday. He already seems to be enjoying the world but there is so much complexity in there that it amazes me kids get so much out of these. No Senran Kagura Burst and Resident Evil: Revelations? Luigi Edition 3DS XL is on sale for 150€ on my local store and I've been thinking of getting one for my kid since he likes Luigi a lot (I brainwashed him tbh so I could play Mario on coop ) and we don't have a 3DS yet. I've already bought AC:New Leaf and ALBW for 8€ each (new) last month. It's pretty entertaining how these are the games these kids may be nostalgic for in the future and might be their first exposure do the franchises. That's going to feel weird. Although i guess most older people here already know that feeling. At the end of the day, this proves one thing. The family and kids market will always remain Nintendo's strength over its rivals. No matter what, Nintendo will always have a draw with those two audiences that Sony and Microsoft will never have. Not to mention that while everyone loves to rag on Mario and the other Nintendo characters for being outdated, the fact is, they still remain timeless characters that sell games. 30 years later, Mario games can still sell systems and make people who play the games happy. How many other franchises can claim that honor? My 5-year-old nephew beat DKCR3D almost entirely on his own recently. He only had me help with a few boss battes and mine cart levels. @RIC616 My six-year-old self actually took really well to Pokémon when I played it first which, looking back, I'm actually very surprised about! It must've made an impression on me, as I'm still playing today! Can we relax on the Top 10 Games for X system please? @GloverMist Oddly enough, despite having always been a Nintendo gamer and having had every system since the nes, Pokemon always passed me by and I'm only a recent convert myself. Watching my son play made me wish I'd paid attention a bit sooner. The summer is almost over.... this is like the Sunday before school/work. My son has had his Aqua Blue 3DS since launch (3.5 years ago), and with Nerf Armor, screen protectors, and a stylus leash, it's stayed in great shape. I should also mention that he loves playing a bunch of the Ambassador and Virtual Console games, though some of those are more difficult for him. Still, as a mom who grew up on the NES and original Game Boy, I love seeing him enjoy the first Super Mario Bros., Kirby's Adventure, Excitebike, Super Mario Land, etc. Much nostalgia. My oldest son (soon to be 8) is currently playing Tomodachi Life, Rusty's Real Deal Baseball, and collecting puzzle pieces and making his way through Find Mii. He occasionally breaks out Pokemon Y but he seems to be more into the cards and show then the game????? My youngest son (soon to be 5) is currently playing Super Mario 3D Land and likes to wonder around grass in Pokemon X fighting and catching random pokemon. He is currently sharing my 3DS (Mario & Luigi, silver, SE) but we've been talking about getting one for him for his next birthday or Christmas. @Swiket USA is not the only country, you know? Here - for example - we still have 5 weeks to enjoy our summer vacations. My son and daughter both have a handheld (2DS & XL). They love Sonic, Mario, Kirby, Animal Crossing and tomodachi life. My son plays on the Wii u more than I do. My 7 year old loves skylanders and Donkey Kong too. My daughter also likes Petz Magical game. My son wants the angry birds game, Smash Bros and Captain Toad game. He is even better than me at some games, mainly the platforming ones. He also loves the lego movie game, he has lego city and mario golf. But he is a big Sonic fan. Also Pokemon X is a big one for him and my daughter has Y. Not one mention of Luigis Mansion but some of the puzzles had me scratching my head for an answer. Thankfully I didn't need a YouTube walkthrough at all. I'm from the USA and I still have four weeks left. I don't think it's the country that depends on when school starts and ends but the specific region. Yeah, it's regional. My 9 yr old grandson was with us here in central New York all June and July. He started school in Arizona yesterday. Our school doesn't begin til the first week in September. We scarescaped a lot in LM:DM. He scarfed my copy of rune factory 3 and was going great guns in it (tho when I mentioned he could get married he asked 'Why would I wanna do that?'). I got him Yoshi's New Island and he loves it. We visited each other's towns in Animal Crossing. He played my Henry Hatsworth. He and his dad (my son) played Little Big Planet, Ibb & Obb, and other games on the PS3. They also hiked, swam, caught fireflies...it was a terrific summer. My little man is about to turn 3 and I plan on getting him a 2DS. I have a 3DS and there's no way I'm letting him play with that. He's been playing with iPhones and tablets since he was 1 so I figure this will be the best way to get him started on Nintendo products. I've already got all the games he's be playing (NSMB 2, Kirby Triple Deluxe, Yoshi's New Island, etc.) so that's not a problem. The kid needs something because he's no longer happy just watching me play Mario Kart and such. @Ralizah Which is the point. If that can happen then that is a reasonable difficulty for everybody. (Something like the option for the extra hearts doesn't make it worse for anybody else). If something is too hard we will make the next one easier is not a good thing for kids to experience. My nephew had a similar experience with NSMB he finished it and found it a reasonable challenge but NSMB2 was a total waste of time for him (As it was me). Consider Siesta Fiesta as well. Fun game. They did a terrific job on the security features. I think Sony is behind and doing a good job catching up. Microsoft... well you turn on security then nothing works, so choose between occasional gore ads from popping up or a locked down DVD player. Wait a year or two when they want to play COD and will be doing something to your mothers! because you know, we are n00bs and they can perform 360 no scope headshots! I don't think tablets and smartphones have much to do with kids' instinct to use their hands. Our hands are just some of the oldest, most natural 'tools' we have. Thats why touch controls work so well, so its the other way around. I once tried to have my girlfriend play Minish Cap, and she couldn't figure out how to roll. All these kids sound like geniuses. @Benjelo (@k8sMum) In my country it isn't regional. They have more 4 weeks and 1/2 to enjoy their summertime. @SockoMario If this was a top 10 Wii U games for kids, then there's a possibility of it showing up. I'm surprised New Super Mario Bros. 2 wasn't on the list! Especially since it has local co-op, allowing parent and child to play together, it's easier than 3D Land, too, since it's only 2D. Kids should play outside in the summer. They'll have to spend the whole day indoors when school starts up again, and even worse, when they grow up they'll be stuck in an office from sunrise to sunset. Encourage your kids to go outside and explore the world this summer. @Zombie_Barioth I don't recall many of my friends pawing on their Game Boy or Game Gear screens back in the day. Kids have phones and tablets shoved in their faces almost before traditional consoles, as they are devices which their parents have on them all the time, and therefore make the ideal distraction when you're in the car and the kids are playing up or getting bored. You have a point, but this early exposure to touch-driven interfaces certainly influences how children approach other devices. Glad tk see that kids can still handle a challenge like that in DK Country Returns. I agree that Luigi's Mansion should have gotten some mention. My kids play outside all the time. They just happen to love video games too. My kids spend more than half the day outside thank you very much. We live in Southern California, and my son has still has 2.5 weeks left until school starts. Some in our area don't start until more than a week after that (the day after Labor Day). Other countries are also on different schedules. Wow, thanks so much for the (unsolicited) parenting advice. My son already plays outside a lot year-round, and I suspect that's the case for most others here as well. It's actually okay for kids to have a variety of interests and for video games to be one of them. As a member of the Nintendolife community, of course I am a fan of video games and so it should come as no surprise that I also think kids should be allowed to play them. In fact, some of my happiest childhood memories involve saving up enough rupees to buy a blue ring, jumping on a button to make a bridge disappear, and shooting even the fastest ducks. It's just that I think this should be done sparingly, and so I took a moment to encourage parents to consider alternative recreational activities. I don't think that's entirely out of line - I mean, Nintendo devices are actually programmed do the same thing (I'm sure you've gotten the "Why not take a break?" message before, which was probably even less solicited than my original comment). Looking back, I realize my comment could never actually convinced anyone of anything, except maybe that I was trolling for negative feedback, which I really wasn't. I'm happy your son plays outside a lot. I'm sure he'll treasure his time with nature at least as much as his time with Nintendo. Let's hope more parents are like you. Your certainly right about that, people like what they know (i.e touch screens). I guess you could say my point is finger paints and mud pies came before smart devices. As soon as your kid shows up in public with Pokemon X or Y and a 3DS in hand, they're instantly the cool kid.